Are Hoof Bruises In Horses Painful? Yes. Hoof bruising can cause very mild discomfort to severe lameness. When the hoof experiences trauma the blood vessels within the hoof rupture causing blood to pool. This pooling builds pressure within the hoof, causing pain. 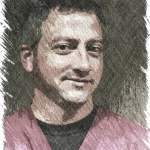 Secondarily, the pooling creates an ideal environment for bacteria to grow, which can bring about a very painful and debilitating abscess. 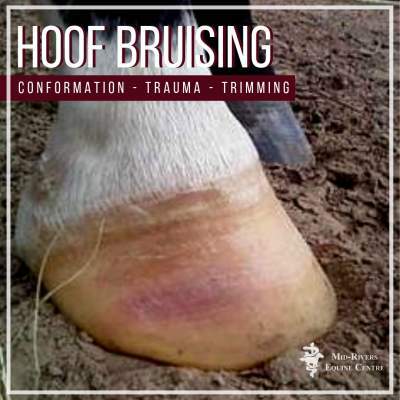 While we most often associated bruising with some sort of trauma, like horses banging their foot against a stall wall or stepping on a rock, conformation can play a role in chronic hoof bruising. Horses who have naturally thin soles, who are upright, or are flat footed are predisposed to bruising. If your horse experiences chronic bruising, work closely with your farrier and veterinarian to discuss shoeing options to prevent bruising, and ultimately, more serious foot issues. Remember, those tiny ruptured blood vessels feed the sensitive laminae that connect the horse’s outer hoof wall to bone. It is important to keep the laminae healthy to avoid laminitis. It is unavoidable: your horse will experience hoof bruising at some point, and the weather can be a factor. Hooves become too soft in moist conditions, making them prone to bruising. In fact, you may notice an uptick in bruising during the spring thaw and rains. Working on frozen ground or hard surfaces causes impact bruising (and it stings). Improper shoeing (shoes too small, trimmed to short, left on too long). Direct contact with stones or hard debris. Trauma, like knocking it on the stall door as the horse exits, or hitting it on the trailer the horse is loading. If you pull your horse’s shoes for winter, make sure to pull them before the ground freezes, this allows the soles time to toughen up and thicken. Talk to your farrier about adding protective padding to shoeing. Smooth out rutted, bumpy pastures before the ground freezes. Don’t work horses at more than a walk on frozen ground, on hard or frozen arenas footing, or concrete. Remove snow packs from horse hooves. Snow melts and refreezes causing ice balls to form on the soles. It’s like walking on one giant rock all day long. Remove rocks from riding areas. Ask your veterinarian about supplements for horses with naturally poor hoof quality. Ask your farrier about hoof dressings to improve overall hoof quality. Shock Wave Therapy For Your Horse’s Back? Yes!